By Xah Lee. Date: 2018-12-03 . Last updated: 2019-03-11 . 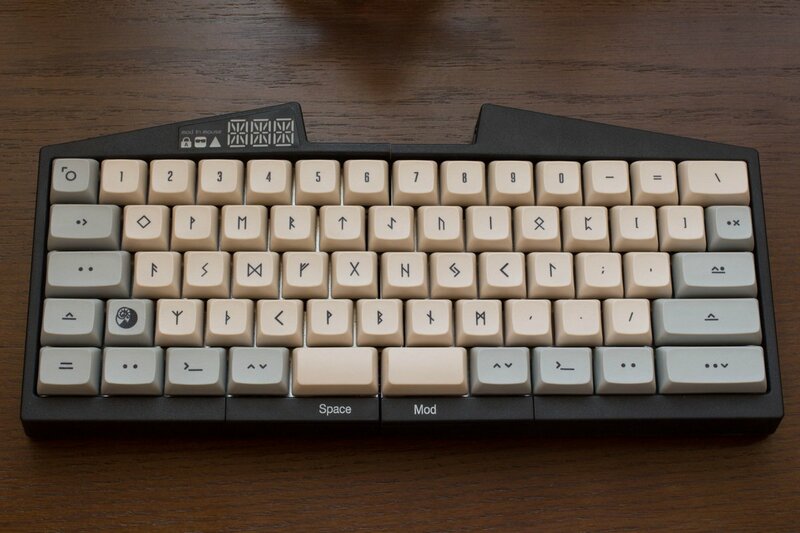 This keyboard, was announced back in 2015 or so. It certainly took them a long time. But is now shipping. Superb. First impression: compact, solid, well built. In fact, been using it in the past 2 days for real work. Super impressed with the software. It is the most intuitive firmware UI and most advanced keyboard software i've ever seen. I'll be adding more video in the comping days. 2019-01-19 I've been using this keyboard for 50 days now, typing on it more than 3 hours per day. I consider it best compact keyboard money can buy. Total key count: 64. Plus 2 thumb (mouse-like) buttons. Mechanical key switches of your choice: Kailh red blue brown. Cherry MX green, clear. 3 digit alphanumeric LED display to show current layout. Supports Mac or PC configuration (the position of ⌘ command/❖ Window and ⌥ option/Alt keys). Advanced prommability of the keys. Unlimited profiles. Macros. Special function keys. Dual role keys. For example, a key can temporarily act as Control when held down. Configuration for entire keyboard can be imported/exported as file, share with friends. 2 extra mouse-button-like buttons in thumb area. Can be programed like any other key. Builtin, hardware based mouse emulation by key. i.e. you can use this keyboard as mouse. 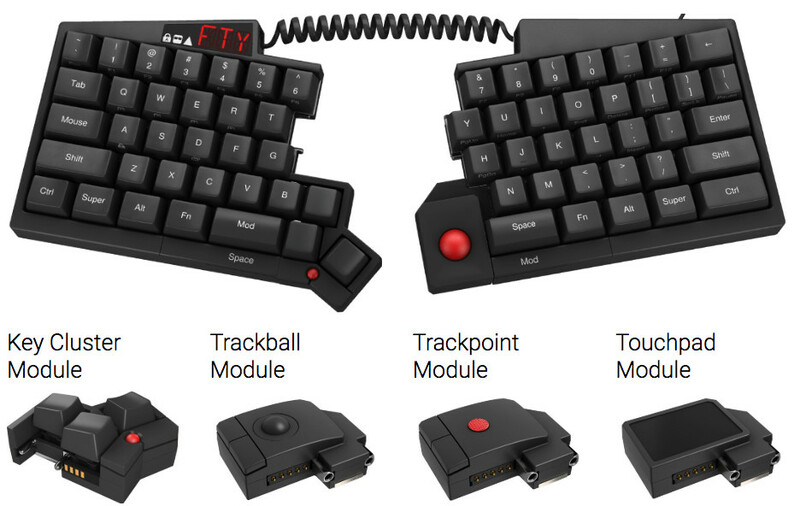 Thumb oriented trackball, trackpoint, trackpad, addon modules. When the 2 pieces are connected, no connecting wire is necessary. To disconnect them, just pull them apart. They are connected by magnets. The alphanumeric display shows 3 letter abbrev of your current keymap (aka profile). Base layer → normal typing. Mod layer → hold down Mod key, other keys become navigation keys, such as arrows and page up/down. Fn layer → switch layouts (qwerty, dvorak, colemak, PC/Mac. ), multimedia keys, sleep key. Mouse layer → hold down Mouse key, other keys move cursor or do mouse clicks. The Mod key layer gives you all the navigation keys, and some macros by default to switch tab/window/workspace. Hold down the Mod key to change other keys into navigation keys. Press the Mod key twice to lock it. Press it again to unlock. When the Mod key is locked, the Mod indicator lights up. The mod layer by default also lets you switch browser tabs, new tab, close tab. And switch window and workspace. The mod layer is the best thing. 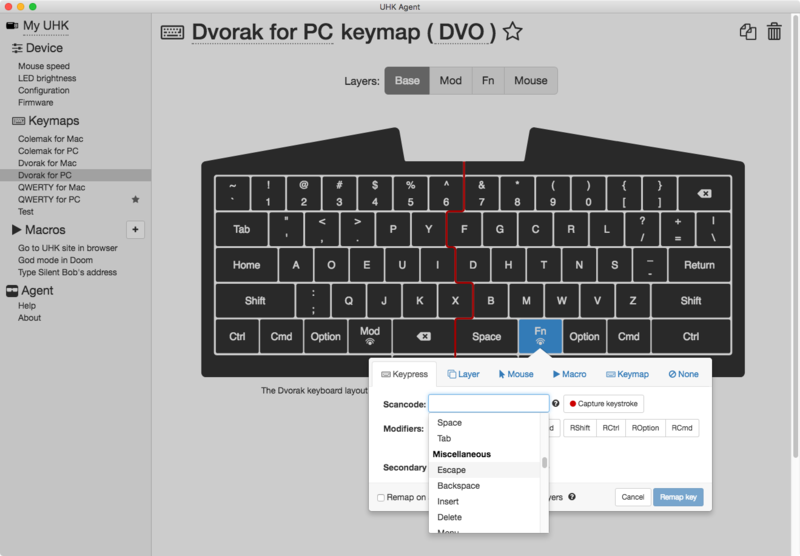 The Fn key layer lets you switch among QWERTY, Dvorak, Colemak, PC/Mac layouts, and gives you multimedia keys. The digital display shows the current layout you are in. Press the Fn key twice to lock it. Press it again to unlock. When the Fn key is locked, the Fn indicator lights up. The keyboard is designed to also function as a full-featured pointing device. Hold down the Mouse key to change keyboard into a mouse. Press the Mouse key twice to lock it. Press it again to unlock. When the Mouse key is locked, the mod indicator lights up. I think it's very nice for casual use, but if you do a lot image editing or 3D modeling, using a real mouse, or trackball, or digital pen, is much better. The software to program the key into memory is called Agent. It's available for Microsoft Windows, MacOS, Linux. It is the most smooth, most intuitive, and most feature rich keyboard software out there. For each profile, there are several layers controlled by Mod, Fn, Mouse, modifier keys. Remap any key. Any key can be any other key. For example, key A can become any modifier key if you want, or a modifier key such as Fn can be set to a non-modifier key such as Esc. Create key macros. I.e. A sequence of key presses. e.g. Ctrl+c for copy. 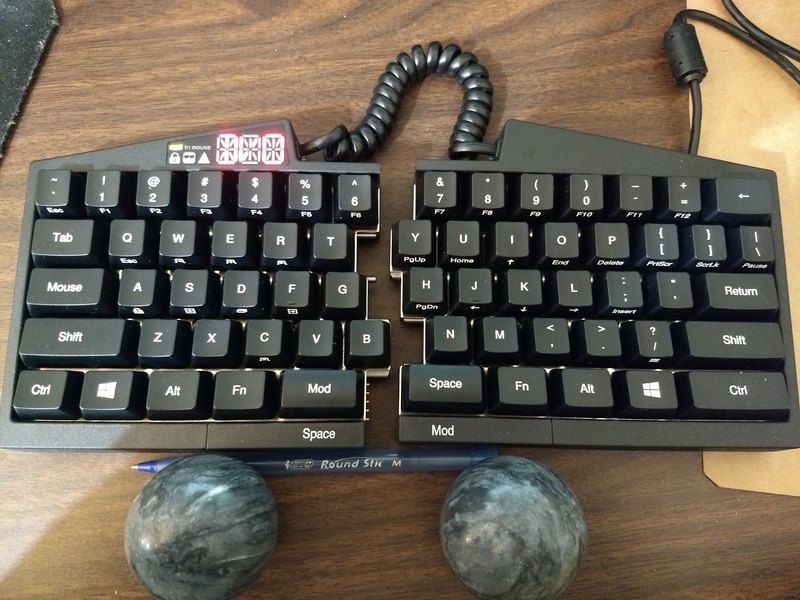 This is one of the best ergonomic keyboard on the market. I'd say, among top 3. Among compact keyboards, this one is the best, period. The programing capabilities of this keyboard is the best out there. The software, is also best on the market, bar none. 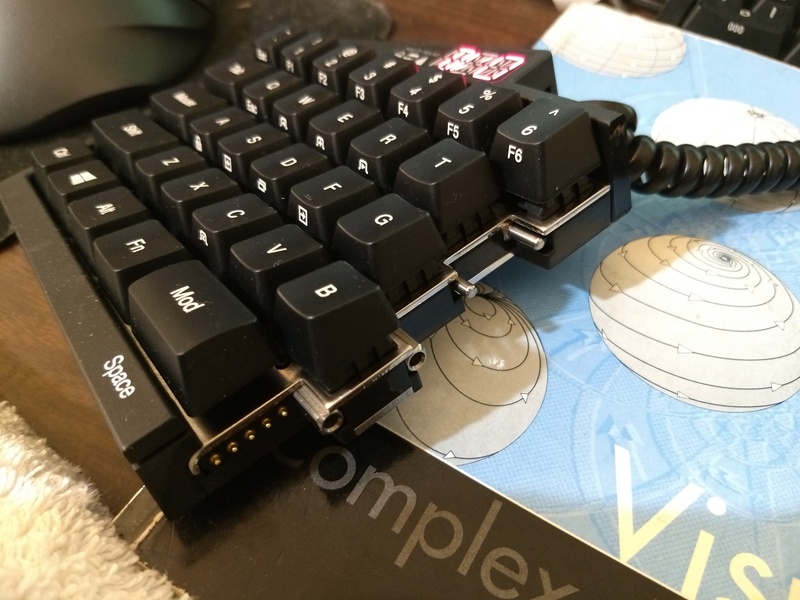 Because of the programmability of the keyboard, you can actually buy this keyboard and use it as a programing pad by itself. e.g. 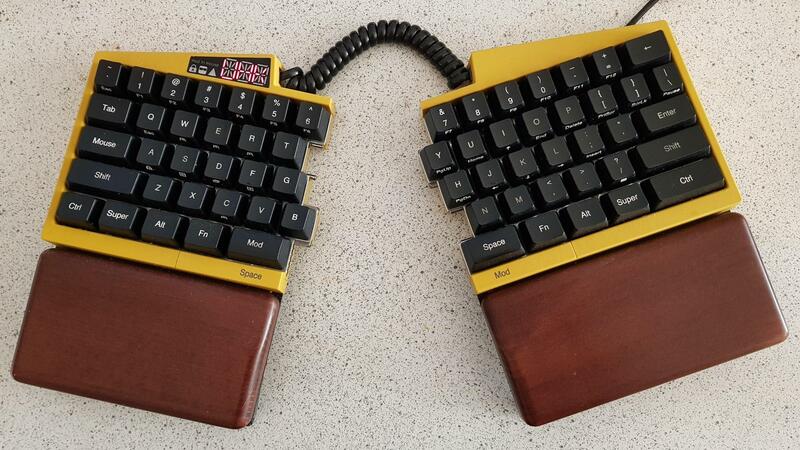 Buy 2, and use one as main keyboard and use another as macro keypad. 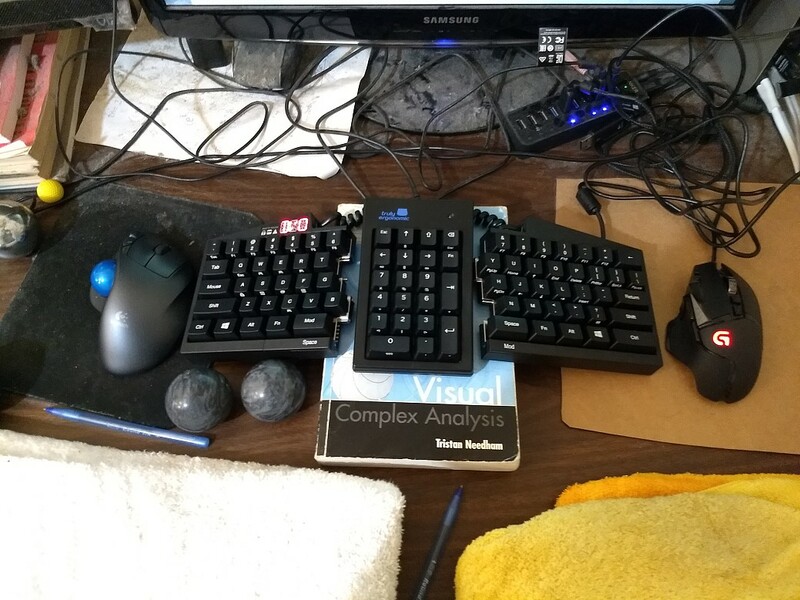 Since this keyboard is so compact, it works well that way. The ease and intuitiveness of the software makes it super easy. The keyboard is highest quality built. 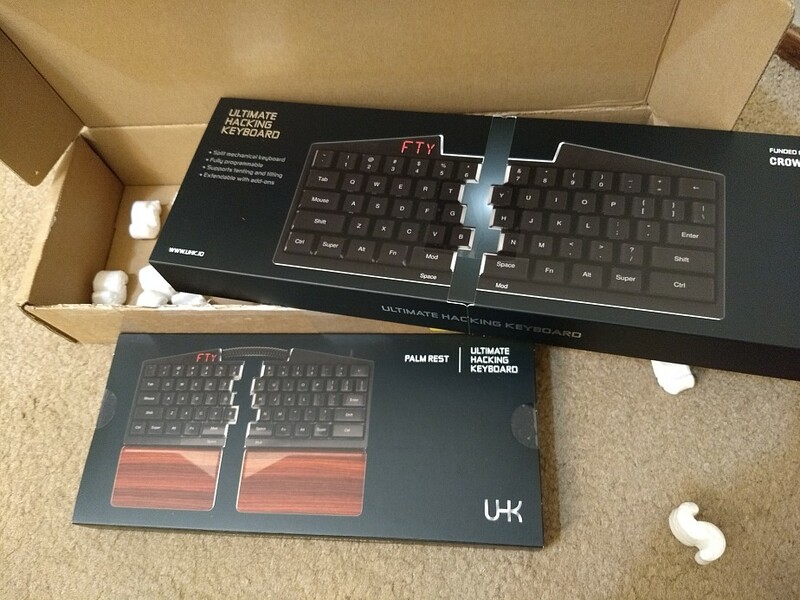 Add a array of physical function key F1 to F12 at top. Add physical arrow keys in a inverted T shape. Remove the 3 digit LED. (they are nice, but not that much useful.) Replace them with say 6 simple LEDS, number 1 to 6, or marked QWERTY, Dvorak, etc, for indicating current profile. Remove the triangle wedge shape at the top, make the keyboard rectangular in overall shape. Actually, i can't say i have any cons for this keyboard. I would like a ortholinear grid layout, but if you do that, you reduce potential buyers by some 90%, because vast majority of people are still very used to the staggered layout. Also, i'd wished there's physical arrow keys. The way they did it, by holding thumb key (Mod) and right hand I J K L becomes arrows, works fine. Also, press Mod twice will lock it into place. So, you can play pacman while eating pizza with this keyboard. But still, physical arrow keys are nice.